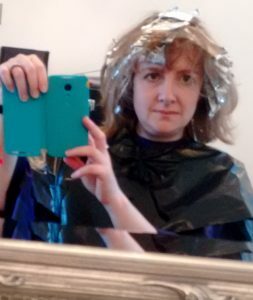 Having highlights put in is something that I used to do, back when I had time and disposable income (ie before I became a mum). 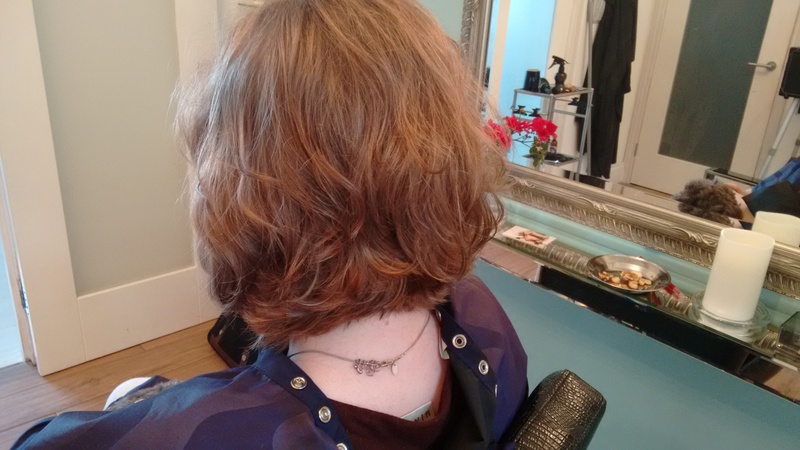 I have hair that is naturally brown, with natural highlights that get brighter in summer, and a haircut that has been in ‘maintenance mode’ since I first had it cut to shoulder-length, 8 years ago. 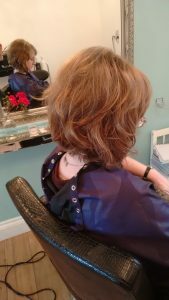 It was definitely time for a change of cut, and highlights to put some liveliness into my hair, so Maria got her hands on me! We began by looking at the different colours available in the Wella Illumina range she uses, which is their professional brand, available only in salons. Holding different samples against my head, and fanning the strands through my own colour, we established which shade worked best, the most natural look, that enhanced my natural colour the best. concentration required to get the right balance of different colours is quite intense! We opted for a single colour, though next time I go, Maria explained that she will highlight some strands that are already highlighted, and some that aren’t, giving effectively three colours – normal, ‘one treatment’ and ‘two treatments’. She also varied the amount of colour she applied, using varying amounts of the carrying agent, and washing some of the highlights out 20 minutes before she dealt with the rest, so it isn’t really just normal and ‘one treatment’, even now. imagine actually doing it also takes something out of you! Once Maria had taken out all the foils, she applied a solution to stop the colour continuing to work, and then rinsed the whole lot off, shampooing three times to ensure that no lingering colour paste remained, then setting me up with a towel and cape. Then the fun part started. Having had a good look and feel of the shape of my head, Maria walked round me several times, before explaining what she had in mind. Something that I’d be able to take care of easily, something that would be right for the shape of my head, and something that will make the most of the new colour. At which point, the scissors came out. By the time Maria had finished, I had her poodle asleep in my lap, covered in brown snippets of hair, and a ‘wow, is that really me’ hairdo, that has drawn compliments from everyone who’s seen it. The highlights are so natural-looking that unless you know what colour my hair used to be, you’d never know there was any colour involved. 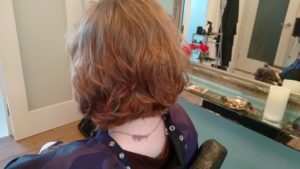 And the cut is shorter than I&#39;ve ever had it, but without being ‘short’, tapered round my face, very slightly higher at the back, and making the most of the natural waves that I have been blessed with. 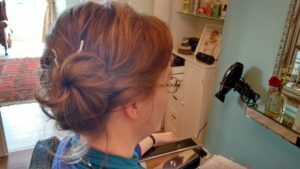 Judicious application of styling products, and a good shake, are all it needs to look fabulous, which is perfect for me, as a busy working mum. The fact that it makes me look younger is a bonus I’m happy to take! !